If you are looking for a used Porsche Cayenne in Vancouver, North Vancouver and surrounding area, the Goldline Motors sales team will be able to satisfy your needs. 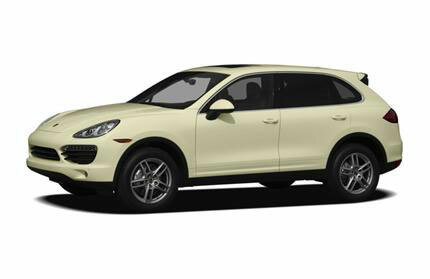 Goldline Motors always has a great selection of pre-owned Porsche Cayenne in stock and add to the vehicle inventory daily. At Goldline Motors we proudly sell used Porsche Cayenne to customers from Vancouver, North Vancouver, Richmond, Burnaby, Surrey, New Westminster, Coquitlam, Delta, Abbotsford and Victoria. The Porsche Cayenne combines legendary Porsche sports car performance with convenient SUV utility and all-condition capability. The all-wheel drive, five-passenger Cayenne is available in three trims: V6, S, and Turbo. The V6 is powered by a 300-hp 3.6-liter V6 engine, the S is has a normally aspirated 4.8-liter V8 with 400-hp, while the Turbo is gets a 500-hp twin-turbocharged version of the same 4.8-liter V8. A new eight-speed automatic transmission with an auto start-stop system is available on the V6, standard on the two V8 powered trims. Notable features available on the Cayenne include: Porsche Stability Management (PSM), Porsche Active Suspension Management (PASM), Porsche Dynamic Chassis Control (PDCC), a conventional moonroof or a panoramic roof system, Bi-Xenon headlamps, power memory seats, 4-zone climate control and a Bose surround sound system. For 2011, the Cayenne is a complete redesign from front to back, shedding weight, while adding power and fuel efficiency.The Porsche Boxster is a two-seater mid-engine roadster reminiscent of the legendary Porsche 550 Spyder. The second-generation Boxster pays homage to its roots with the inclusion of a lightweight open vehicle concept Spyder model, showcasing a unique removable canvas top. Source: Chrome Data. Prsche Cayenne Reviews: The trio of suspension settings - comfort, normal, and sport - offered by the Cayenne's optional Porsche Active Suspension Management (PASM) does a superb job of catering to various drivers' preferences. -- Car and Driver.....The Cayenne in any form is a wonderful, quiet, plush, and luxurious highway cruiser... -- New Car Test Drive.....Shaving 400 pounds from a vehicle - any vehicle - is bound to have positive repercussions, and Porsche has combined the Cayenne's diet with a new range of tech to improve on a recipe that's been selling by the bushel for years. -- Popular Mechanics. Source: Chrome Data.